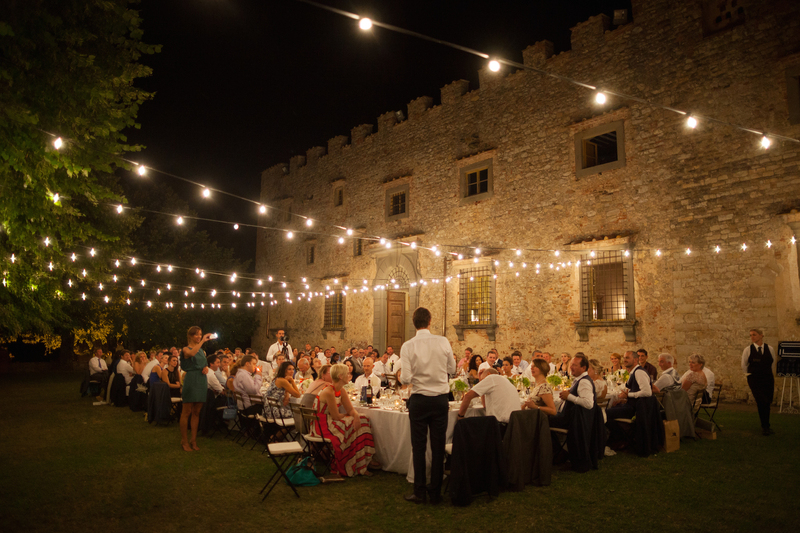 Last wedding season has been really amazing, lots of new venues, bigger weddings, lots of menu tastings and above all my first experience in a real medieval castle in the Chianti. I already had the opportunity to visit many castles in the surroundings but the Chianti is definitely my favorite region. 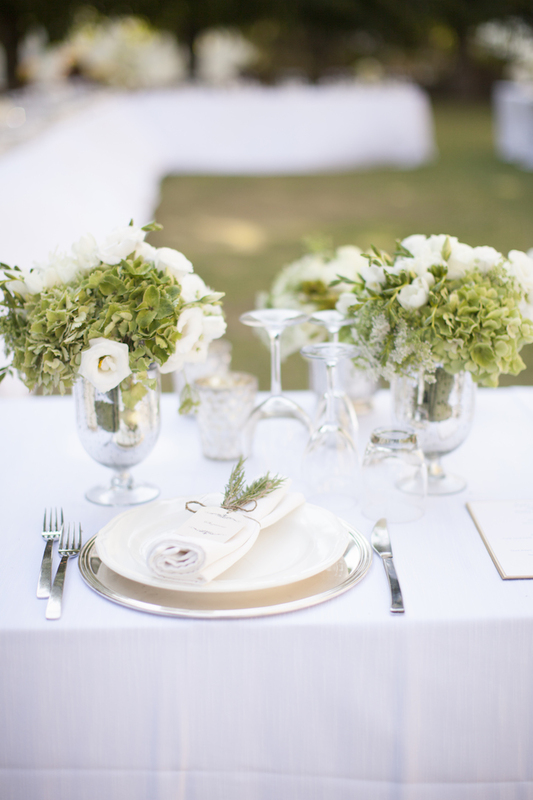 I always wanted to have a wedding there, so when Sophie and Wulfric came to Italy and made their decision for this venue I was more than happy to start the planning project! 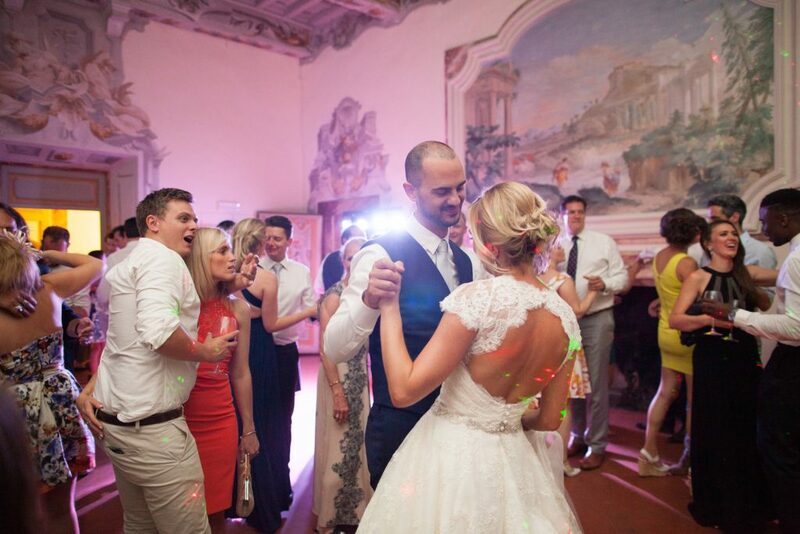 People were coming from all around the world so it was a good opportunity to show how wedding in Italy are! The night before the big day all the guests had a pizza party in the pic-nic area of the castle, and this gave the opportunity to know each other better. Sophie and her bridesmaids got dressed in the Bridal suite on the ground floor: no plugs were provided for the hair dresser so I had to send one of my colleagues to buy 3 at the closest village that is just 5 kilometers driving!!! 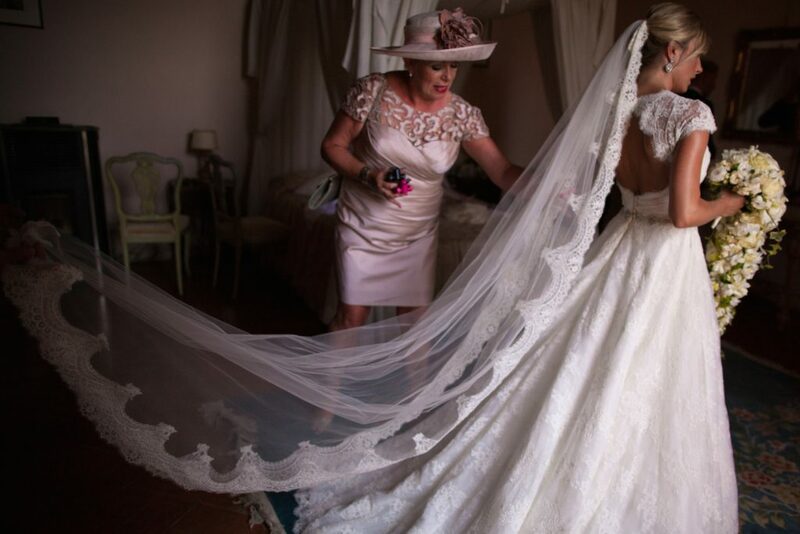 🙂 No panic, all the girls were ready for the big moment and when Sophie wore her Caroline Castigliano gown and she really looked like a princess. The dress was made with white lace and had a long veil all around. The ceremony took place on the highest hill overlooking the Castle; then the guests walked downhill the pebble road “under the real Tuscan sun” !!! 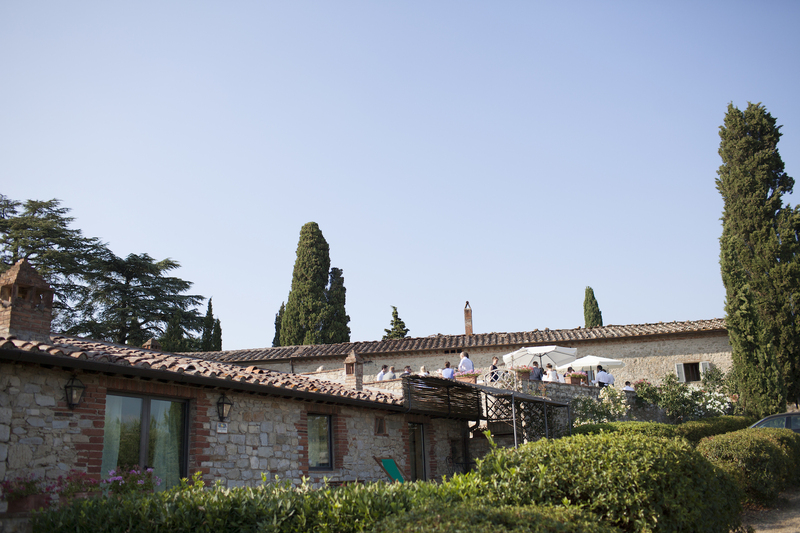 The aperitif was organized in the herb garden and everybody had the chance to taste any kind of appetizers paired with wines from all around Italy. The string quartet continued playing despite the July sun when temperatures arrived until 42°.. tough guys!! 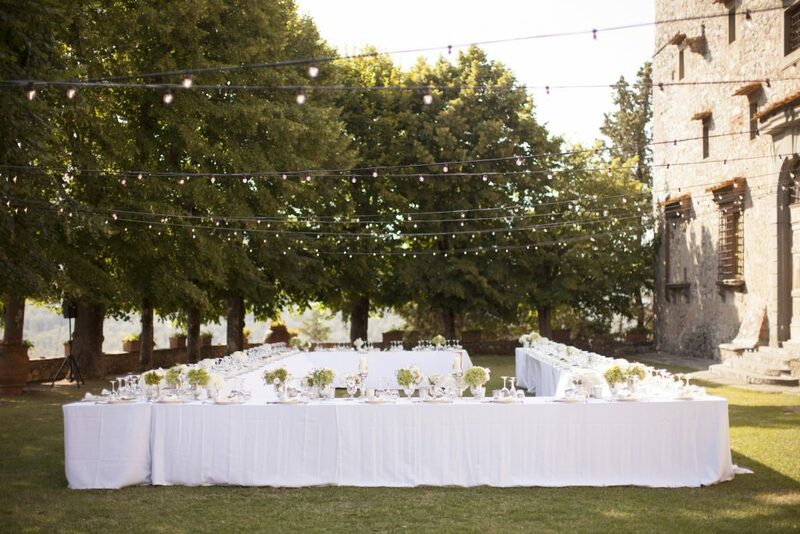 After several pictures and drinks all the guests moved to the main courtyard of the castle were the tables were set for dinner: a typical tuscan menu choose by the bride and groom with dishes suitable also for their vegetarian guests. But the best moment of the dinner was having the chef preparing the wedding cake in front of the guests: a real millefoglie with cream and fruits done express for Sophie and Wulfric. Then Andrea Dj helped us dancing the night away and after a few hours taxis and vans came to collect the last guests who were still dancing…When I arrived at my hotel’s door I had real problems seeing the hole where to put the key but the cat of the hotel came and started scratching to the door that was incredibly open.. I fall asleep as soon as I reached the bed, but when I woke up I realized that the wedding was the day before as soon as I saw the big bunch of flowers the happy couple gave me the night before to say thanks for my help….I slept with it on my bed!! 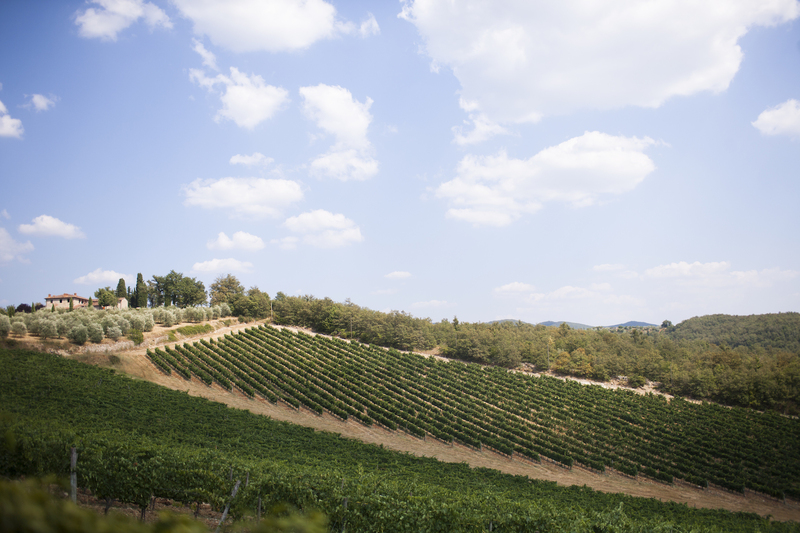 I always leave Chianti hills with a little bit of sorrow, remembering the period when I was living here but now I’m really happy because I know I helped another couple to realize their dream of getting married in an amazing place: Tuscany! 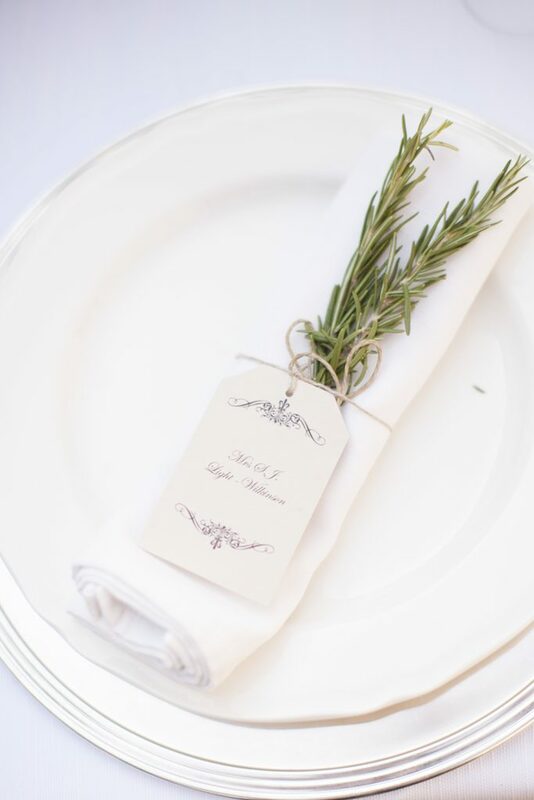 If you want here you can see a trailer of their Wedding video: hope you enjoy watching it as I did and thanks to Fulvio Greco Films and James Allan for the great video and pictures! !